Samsung has been showing-off futuristic bendable phones for years, but it wasn't until the Galaxy S6 Edge arrived in 2015 that we started believing that the smartphone could have a future beyond straight sides and flat screens. 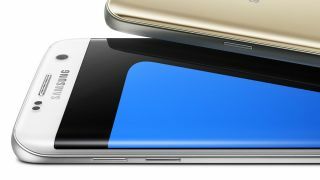 There's more to the second-gen Samsung Galaxy S7 Edge than flexible screen tech and a curved effect on the sides. Try this: upgraded camera, extended battery life, microSD card slot and a waterproof design. That's an impressive roll-call, but in other ways the S7 Edge is a mere mortal, with its glass screen and aluminum curves in need of some protection. Cue our pick of the best cases around that bring out the best in Samsung's greatest smartphone yet. Below, you’ll find several recommendations that cover a wide range of budgets and style preferences. While some of these options are untested, they are each a cut above the rest due to their value and design, and are backed by positive consumer feedback. Looking for the best Samsung Galaxy S8 cases? Given that the Samsung Galaxy S7 Edge is waterproof, the need for over-engineered military-grade cases is questionable. Cue the Survivor, a transparent and scratch-resistant polycarbonate shell that allows for a drop onto concrete from up to 4ft/1.8m. That's pretty good considering the S7 Edge is one of the most delicate phones ever created. If you love the Edge's design and you're really not interested in wrapping it in black plastic, the clear Survivor could work. However, it's also available in Smoke/Black, Pink/White and Blue/Black. Designed to be almost an extension of the Edge's design ethos, this super-thin wraparound from Obliq comes in four colors to match the phone itself; gold, pink, gray and black. However, the Slim Meta is about more than just looks, interrupting its brushed metallic finish with plastic corners. That adds some handy shock resistance right where it's needed, while a second layer of plastic inside the case creates general protection against drops. For those after a case that protects the S7 Edge and takes multiple cards and cash, this oddly-named leather case fits the bill. Inside are three slots for credit cards and notes, with a magnetic clasp to keep everything wrapped-up and safe. The Layered Dandy has another safety angle; a plastic rim makes it impossible for any part of the Edge to get a knock or a bump if dropped, with the protection concentrated on the corners, where even a slight impact can too easily crack a screen. While there are a number of wooden cases around, they’re still relatively rare compared to plastic and even leather ones. Which is a shame, because they look great. This YFWOOD case is a prime example, not just made from a premium material, but also sporting an interesting and eye-catching design. The pictured model is a totem design, but there are several other options available and all of them keep the back and sides of the Samsung Galaxy S7 Edge safe from scratches and minor falls. This two-tone, two-piece case is as simple as it gets. There's valuable protection for the rear and the corners of the phone, but the Accent's low-rise sides help show-off the Edge's unique design. However, even on the sides there's enough of a plastic bumper to protect against any kind of impact. The inside is soft microfiber. Available in navy/silver, pink/gold, aqua/gold, and black, the Accent's bottom quarter comes away for easy removal of the S7 Edge. Tech 21 cases are all about impact protection, but the Evo Wallet does a tad more than offering impact protection from drops of 6.6ft/2m. Inside is a slot for one credit card, but the genius of the flip-over screen cover is that is also serves as a kick-stand for the Samsung Galaxy S7 Edge itself. Great for watching movies on the train or plane, the Evo Wallet is surprisingly slim, with ridged plastic on the outside and soft microfiber within. Available in pink and black. Android Pay is here at last and we don't have to carry around credit cards any longer. OK, just one as backup. The Samsung Galaxy S7 Edge Flip Wallet is ideal for taking on a night out, with a slot for storing a single bank card as well as a cut-out for the camera. However, the USP of this official leather-style wallet cover from Samsung is its clever magnet-powered dot-matrix display, that lets you accept and decline calls without opening it. Admit it: you miss your old BlackBerry. If tapping away with your thumbs using the on-screen keyboard isn't your style or skill, Samsung feels your pain. Its solution is this nifty slap-on keyboard that offers a QWERTY layout. It's covered in hot keys and shortcuts unique to Samsung phones, and while it's detachable, the package also includes a simple protective case for the Edge that features basic protection on all four corners. If you like it, you should put your name on it. Engraving a phone case – even this posh brown leather number from Alston Craig – might seem a little over the top, but this hand-made number is a bit special. The snazzy striped inner-lid doesn't only take a ton of credit cards, but also includes an RFID-blocking lining to protect them from counterfeit readers accessing the RFID data on your cards as you walk by. Samsung is putting out a lot of its own accessories for the Galaxy S7 Edge, but the king so far is this unique Lens cover. Attempting to get over the limitations of a fixed lens, the package contains two separate lenses – a telephoto and a wide-angle – which screw-in to the back. However, do remember that adding more glass to a phone camera always means less light. When nothing is attached the thread socket doesn't poke out much, making this unusual specialist photography case perfectly suitable for everyday use, too.